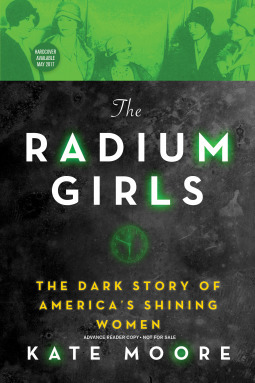 The Radium Girls: The Dark Story of America’s Shining Women by Kate Moore, Sourcebooks (April 2017), Advanced Reader’s Copy courtesy of NetGalley. Wow. I’m not sure where to begin. I’d heard rumblings about this book, then I saw it on NetGalley and decided to request it. I was a little put off by how long it was, and although I still think there was more detail than was necessary, I read right to the end because of the story. In the early part of the 20th century, radium was believed to be a wonder drug, and was used for all kinds of health ailments. It was also discovered that a radium-based paint could be used to paint the dials of watches so that they would glow in the dark. At the start of World War I, these watches were in high demand, and the women who were employed as dial painters were sought after, and well paid, for their work. The work required a very fine-tipped brush to do the precision work, and the women were taught put the tip of the brushes into their mouths to make the tips even finer. Not only were they ingesting radium each time they did this, they were covered in the dust, and often glowed from the material that settled on their clothing and bodies. Soon, many dial painters started experiencing mysterious illnesses, particularly issues with their teeth, jaws, and bones. The companies learned early on that perhaps radium wasn’t as safe as they had originally thought, but did nothing, and denied that these women were sick with any workplace-related ailment. The cover-up continued as more women because sick, and started dying, and were unable to take on the powerful corporations who continued to lie about the medical test results. This book is quite graphic in its descriptions; the effects of radium poisoning were horrific, and the suffering these women experienced was terrible. Still, although it was a sad and infuriating read, it’s important to shed light on this piece of history. In many ways I was reminded of how I felt when I read Hidden Figures or The Immortal Life of Henrietta Laks; these were women whose stories have had a significant impact on our history, but of whom we’ve never heard. For that reason alone, I encourage readers to give this one a try.